The Irish and English rugby legends meet in a last-man-standing clash at Stade Felix Mayol this afternoon. 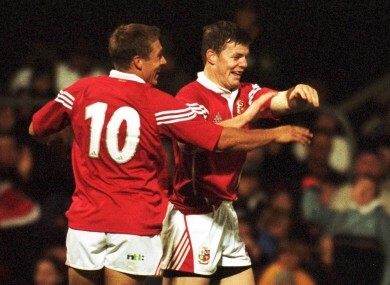 Jonny Wilkinson and Brian O'Driscoll celebrate a Lions try in 2001. NOT MANY RUGBY players can claim a comprehensive win/loss record of English goal-kicking legend Jonny Wilkinson but, then again, not many rugby players are like Brian O’Driscoll. The Irish centre, who retired from Test rugby in March, has faced Wilkinson, for club and country, on nine occasions and won six times. Indeed, since England monstered Ireland at Lansdowne Road in 2003 to claim a Six Nations Grand Slam, Wilkinson has not bested O’Driscoll. The pair first clashed on the Test stage in 2000 and Wilkinson [then 20] had the upper hand over O’Driscoll . The out-half kicked 20 points as England destroyed Ireland 50-18 at Twickenham. O’Driscoll gained a measure of revenge the following year as Ireland won 20-14 and Leinster defeated Wilkinson’s Newcastle side twice in the Heineken Cup pool stages. Wilkinson’s last two wins over O’Driscoll came in consecutive years, 2002 and 2003. He was the goal-kicking, drop goal phenom in a rampant, bruising England team that would go on to win the Rugby World Cup. Injury intervened — with Wilkinson the worst affected — and the pair would not face off again until 2007. By this stage, Ireland were an altogether tougher prospect to play. Wilkinson scored eight points at Croke Park in 2007 as Ireland turned on the style to win 43-13. Three years passed but the outcome was the same for Wilkinson as Ireland won their 2010 Six Nations encounter 20-16. Ireland denied Wilkinson his second Grand Slam in his last meeting with O’Driscoll. Declan Kidney’s team tore into the Six Nations champions-elect, in 2011, and won 24-8. Between them, O’Driscoll and Wilkinson have won four Heineken Cups, scored 498 points over 151 appearances in the competition, including 34 tries. The duo have also played together, for the British & Irish Lions, in four Test matches. Their first outing was against Australia in 2001 and it was memorable for both. O’Driscoll laced in a try from 50 metres out and Wilkinson kicked nine points in a 29-13 victory. The Lions lost the next two Tests and their final Test appearance together, against New Zealand, was brief as O’Driscoll lasted just three minutes before dislocating his shoulder in a crude encounter with Keven Mealamu and Tana Umaga. O’Driscoll will hang up his rugby boots in the summer and, while the out-half has yet to make a public confirmation, Wilkinson is expected to follow suit. Email “Brian O'Driscoll and Jonny Wilkinson set for final showdown”. Feedback on “Brian O'Driscoll and Jonny Wilkinson set for final showdown”.